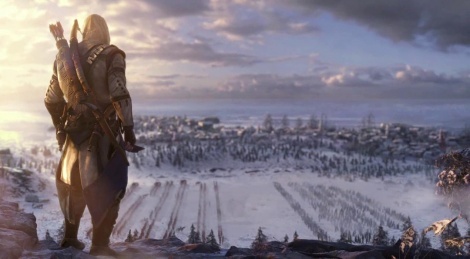 Ubisoft unveils Assassin's Creed III and the new setting of the franchise with the first trailer. Enjoy. Coming on October 31st. Paris, France — March 5, 2012 — Assassin’s Creed® III will hit store shelves on October 31, 2012, encouraging gamers to experience the American Revolutionary War not written about in history books. The largest project in Ubisoft’s history also introduces a new hero for the ages. With a development cycle of over three years and twice the production capacity of any previous Ubisoft game, Assassin’s Creed III is set to release on the Xbox 360® video game and entertainment system from Microsoft, PlayStation®3 computer entertainment system, Windows PC and is also in development for Wii U™ from Nintendo. 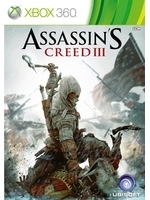 Assassin’s Creed III is developed by Ubisoft Montreal in collaboration with six other Ubisoft studios. New artwork from Assassin’s Creed III also will be featured in Assassin’s Creed Recollection, the real-time board game for the iPad. For more information on Assassin’s Creed, please visit the Assassin’s Creed Official Website (www.assassinscreed.com) and facebook.com/assassinscreed. Sweet trailer, very excited for the game... seems like this is the one to get me back into the series. One of my most anticipated this year. Nice to see them put more time on this one. Looks awesome, as a CGI trailer. But I need to see gameplay video to get impressed and really care for it. CGI meh, come on show some gameplay. This is my 2012 game. This! I'm tired from all this CGI crap. It's pointless, coz game will look nothing like this. Then why did you watch and comment on the trailer? All of the Assassin's Creed games' first reveals have always been CGI. wow the trailer was available for download within minutes! In engine apparently, whatever that means nowadays. I knew the trailer wouldn't reveal much, 'announcement' trailers rarely do. But I've heard all the details and that's enough for me to get excited. I've honestly had little desire to play AC since 1, but this has really caught my eye. Seems like this is going to really mix things up a lot, which the series needed in my opinion. The engine updates sound fantastic as well. They're aiming to make it look 'next' gen on 'current' gen... superlative soundbite or not, I'm expecting it to look killer based on what we've been told. But, perhaps best of all, they're aiming to finish it in little more than a few weeks. Months of tweaking/polishing could do the game wonders. How are you people mistaking this for CG? Go take a look at the previous AC reveal trailers which truly were CG. Go take a look at the previous AC trailers which truly were CG. Yeah, I'd say you're right. Judging by Ubisoft previous CGI-trailers. They have this movie like quality to them. In-engine can mean like Uncharted 3 how they use it for cutscenes but when gameplay shows up its different. In-engine doesn't mean CGI. They're two completely different things. Surprised by the lack of wubwub in this trailer. Aw hell yeah. A new graphic engine. I can't wait to see what gameplay they have come up with. They have made all the character animations from scratch for this one, those in the trailer are just a few of them. The trailer is in-game engine, but this does not mean it wasn't pre-rendered. day one buy for sure...I've loved the entire series since AC 1. I dont see how people write off the series because of tweaks here and there and different gameplay components. I mean sure some were a hit and others were a miss, but ITS A NEW GAME!!! I'm really in it for the story, I just have to find out where this is all going. whenever i see the ubisoft logo at the beginning of a trailer, i remember good old days when they made awesome prince of persia games. AC is great frachise no doubt, but isn't as great as pop series imo..
Mehh. Cant imagine worse settings then that. Parkour on trees ...yeah welcome to 17th century...in america lol. They could choose France, England and many more european countries but nahh...lets go wild west. Red Dead Creed. This isn't the wild west.